Lunch Roundup, time again! Hope everyone’s week is going great! Today’s roundup is for those readers who enjoy the greener things in life; whether you’re a diehard vegan, a casual vegetarian, or a carnivore trying to do Meatless Mondays—do not fright, we’ve got tasty options. We’ve compiled a list of the 5 tasty vegetarian lunches that we found in and around Mesa. So, little herbivores, go out and try these veggie-licious dishes—you won’t be disappointed. After all, it isn’t called Schnepf FARM’s for no reason. Schnepf Farm’s veggie burger may be self-proclaimed “best ever,” but we agree. A black bean patty piled high with fresh Schnepf beets, spinach, tomatoes, onions, and peppers, with provolone, all on a sesame seed bun. Unreal and so fresh. 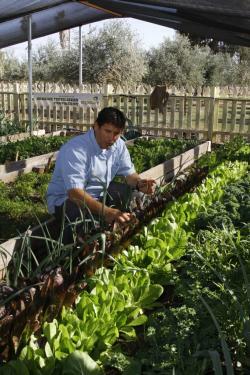 While you’re at it, might as well get the Fresh from the Farm Garden Chopped Salad on the side. This one is shockingly good. To start, try the Mill’s Super Greens and Quinoa salad, with delicious “power grain” quinoa, freshly-farmed cucumbers, tomatoes, red onions, and fresh herbs over a bed of kale, all drizzled with a yummy lemon vinaigrette. It’s a meal within itself, but how could you stop there? Next, dig in to the Olivia Sandwich: classic hummus, cucumber, roasted tomatoes, the Mill’s signature marinated artichokes, fresh lettuce, drizzled with signature garlic olive oil, piled onto a ciabattini roll. You literally cannot go wrong with these choices. Who said vegetarian food had to solely revolve around vegetables? At Postino Winebar East, vegetarians can skip the salad and go for this incredible sandwich instead. Served “NYC style,” this panini is stuffed with a few delicious cheeses and pressed until perfectly melted. Dip into some delicious Sierra Nevada mustard, artisan ketchup or signature pesto. On the side, make sure to order their blend of special olives. The combo makes for a perfectly briny, cheesy lunch—all vegetarian! Veggie lovers really can’t go wrong at Pita Jungle, whose has trademarked “the art of eating healthy.” An AZ favorite, Pita Jungle’s Mediterranean menu is mainly comprised of meatless dishes. Try the grilled vegetable salad, a large plate of fresh greens covered with grilled cauliflower, squashes, carrots, onions, mushrooms, and more. It’s light and flavorful. Pair the salad with the beloved coconut curry soup; the perfect mix of sweet and spicy! Pho, pronounced FUH, is a delicious Vietnamese soup that’s quickly becoming very popular in the U.S. Luckily, Mesa has its own pho restaurant, Unphogettable. 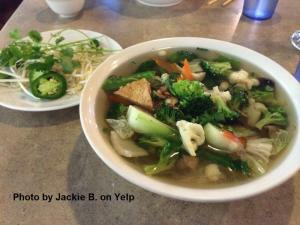 If you’re looking for some memorable pho, look no further than this restaurant. Their vegetarian pho is a huge bowl of tofu, broccoli, cauliflower, carrots, and tons of other vegetables in a delicious, hot broth with Vietnamese herbs and spices. Finish it off with some hoisin or sriracha sauce, if you’re a fan of spicy foods. You’ve got to try this unique vegetarian dish A.S.A.P. !